A shot, usually at the beginning of a scene, that situates where and sometimes when the action that is to follow takes place before it is broken up through editing. Establishing shots also make clear the spatial relations among characters and the space they inhabit. … Establishing shots are usually long shots or extreme long shots, although not necessarily so (Blandford et al 2001: 86). These definitions are fine as they go, but they do not capture something important about the role of establishing shots – they emphasise spatial qualities only whilst ignoring the role of establishing shots in organising the viewer’s comprehension of the narrative chain. Two films provide examples with how sequences begin with a series of shots that do not define the space of the narrative, but nonetheless play an important role in preparing the viewer to receive narrative information. The action of this sequence takes place in three spaces. Firstly, we are in the casino with the gamblers and the owner Little Arnie Gorch, who is informed that “Diamond” Pete is coming to see him (Figures 1-5). Then we move to the office of Little Arnie is the space where “Diamond” Pete first comes across Rico, and he explains that the crime commissioner McClure can’t be bargained with and therefore “Big Boy” has given the order to lie low (Figures 6-9 and 11-22). Finally, it is in the corridor outside the office where “Diamond” Pete and Rico come face to face, setting up the power struggle that will come later in the film (Figures 10 and 23-31). The relevant narrative information in this scene is presented in the office and the corridor, but neither of these spaces is defined by the use of an establishing shot. The office is revealed to us as Little Arnie Gorch enters to see Salvatore and Rico waiting for him, but at no time during this sequence is there a shot long enough or wide enough to give the spectator an overall sense of the spatial extent of the room or the relationships between characters. At no point in the scene is ‘the inter-relationship of details to be shown subsequently in nearer shots’ established. However, the scene does begin with two shots that show us we are in a casino and three shots of Little Arnie being informed that a meeting is taking place in his office. Why does the film begin the scene with in a space in which no narrative action will take place before moving to two other spaces, neither of which are established? Figures 1-5 The opening shots of this sequence from Little Caesar let the audience know where we are and what is happening, but the action will not take place in the spaces we have so far been shown. 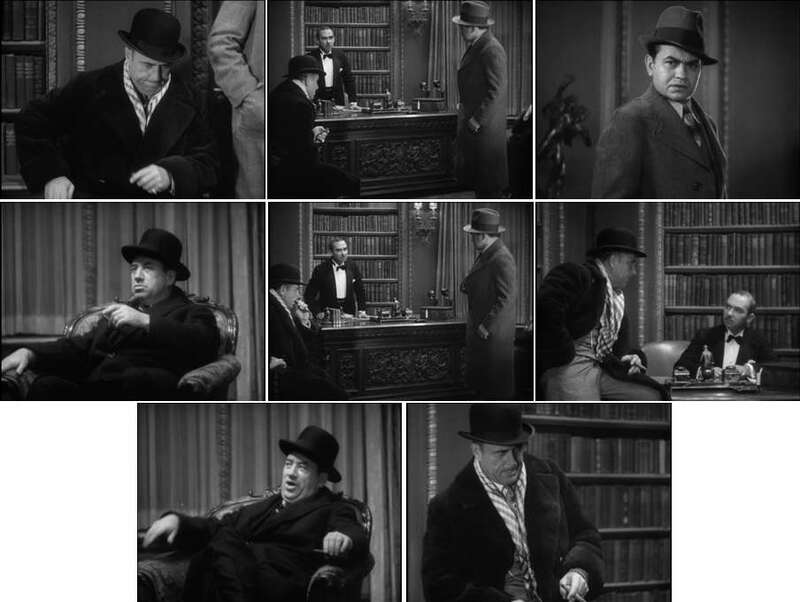 Figures 6-22 The scene then goes on to establish that Rico is a loose cannon who could make trouble for the “Diamond” Pete, who has come to tell the gangsters to lie low. Figures 23-31 In the corridor Rico admires “Diamond” Pete’s finery and images himself taking over Pete’s role. An early sequence in Pleasantville comprises 14 shots (though I have only used 12 here – shots H and I are repeated), and sets up Tobey Maguire’s character as your typical shy high school student. 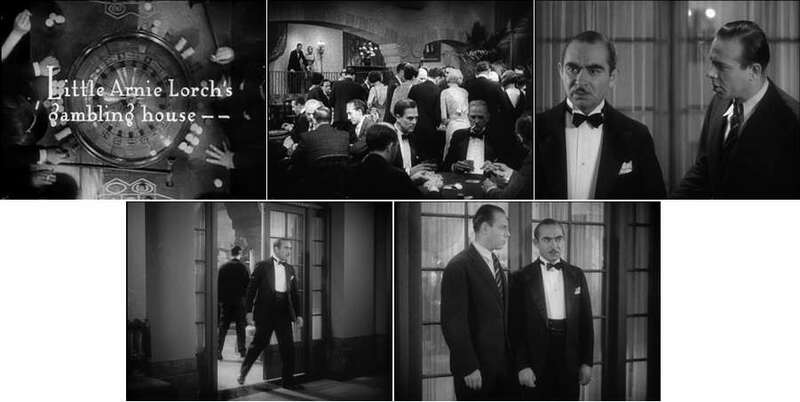 The narrative of the film follows his character’s transformation into a more confident person having been sucked into a 1950s television show. The first seven shots (A-G) are of student’s arriving at school, but do not feature any characters who we will follow through the narrative. In fact, these seven shots reveal no narrative information whatsoever, and there is no dialogue until we see David in shot H. He appears to be asking the girl in shot I out on a date who would seem to be listening intently, but in shot J the distance between these two characters is revealed: David is in fact talking to no-one, and in shot K we see the girl is actually talking to some one else. The final shot of the sequence (L) is a very long shot of the school yard, and perhaps comes closest to the two definitions of the establishing shot given above except that it marks the end of this sequence rather than its beginning. There is no shot in this sequence that establishes the spatial relationships of the narrative action that is to follow. There is no spatial continuity between shots A through G, and while H through L are spatially related we do not know how they are related to the earlier shots of this sequence. The dramatic impact of this scene clearly depends on delaying the viewer’s awareness of the spatial distance between David and the object of his affections, but why then does it take so long to set up the sequence with seven shots that tell us nothing in particular about the narrative? What is going on in these two films? Only shot L in Pleasantville comes close to the definition of an establishing shot, and yet in both sequences we have a series of shots that let the viewer know where we are. While it is certainly a part of the function of these shots (1-5 in Little Caesar, A-G in Pleasantville) to tell the viewer we are here, I think there is also an additional function of orientating the viewer in the narrative chain. These shots carry no narrative information, but they perform an important role in preparing the viewer to expect narrative information. The role these shots play is to alert and orientate the viewer – they say “here is a new sequence, pay attention.” In Little Caesar we also have dialogue to tell us what is going to happen in the rest of the sequence. These types of preparatory gambits occur in language, and are called prefacing devices. Prefaces comprise a varied class of phenomena in the context of human interaction (gestures, micro-moments of silence, fully formed statements) that occur as prefatory components to bigger things to come (Streeck 1995). The function of a preface is to ‘foreshadow’ or ‘project’ something that comes after them, to bring into play and ‘prepare the scene’ (Sacks, Schegloff, & Jefferson 1974; Schegloff 1984). Prefaces enable others to anticipate intended actions and to respond accordingly, thus synchronizing the understanding of the participants (Goody 1995). This is, I argue, what is happening in the opening five shots of Little Caesar: we are being prepared to receive narrative information through a combination of shots, titles, and dialogue. In Pleasantville, the opening of the sequence is unnecessarily long: the same effect could have been achieved with fewer shots but the delay of the reveal is also important here. 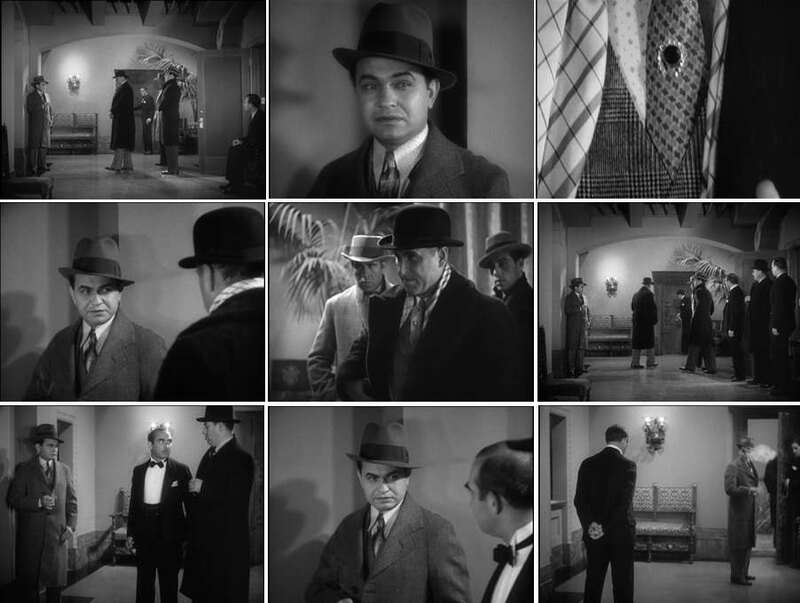 The establishing portion of this sequence not only makes the viewer aware that something is going to happen but also contributes to the narrative effect by heightening the viewer’s expectation of events to come. The establishing shot occurs at the beginning of a sequence. The establishing shot does not necessarily occur in isolation, and we may find that we are dealing with several establishing shots in any particular sequence. The establishing shot is non-scalar: it is not limited to long or very long shots, and can be of any focal depth and field of view. The establishing shot may set up the overall space of a scene that will subsequently be broken down through analytical editing, but this is neither a necessary not a sufficient requirement to define its role in establishing a sequence. The establishing shot serves to orientate the viewer to the flow of the narrative by alerting her to the beginning of a new sequence, but does not itself carry narrative information. Persson (1998: 24) writes that ‘some cinematic conventions … are not totally arbitrary. 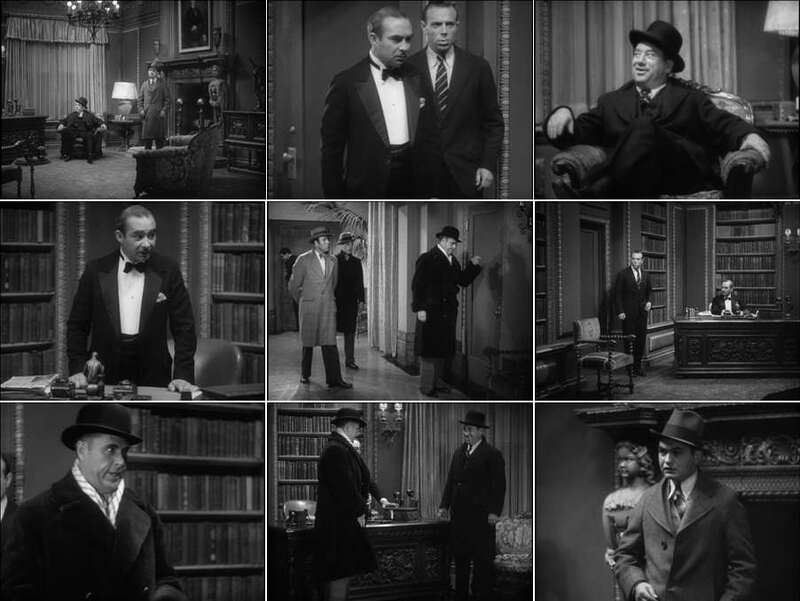 They are designed with careful consideration to the socio-psychological makeup of the spectator in order to produce specific effects.’ Establishing shots are not arbitrary and have an important role to play in organising the viewer’s attention so that these specific effects may be achieved in the viewer by the film. Blandford, S., B.K. Grant, and J. Hillier (2001) The Film Studies Dictionary. London: Arnold. Goody, E.N. (1995) Introduction: some implications of a social origin of intelligence in E.N. Goody (ed.) Social Intelligence and Interaction: Expressions and Implications of the Social Bias in Human Intelligence. Cambridge: Cambridge University Press. Persson, P. (1998) Towards a psychological theory of close-ups: experiencing intimacy and threat, Kinema: A Journal for Film and Audiovisual Media 9: 24-42. Reisz, K., and G. Millar (1968) The Technique of Film Editing. London: Focal Press. Sacks, H., E.A. Schegloff, & G. Jefferson (1974) A simplest systematics for the organization of turn-taking for conversation, Language 50 (4): 696-735. Schegloff, E.A. (1984) On some gestures’ relation to talk, in J.M Atkinson and J. Heritage (eds.) Structures of Social Action. Cambridge: Cambridge University Press: 266-298. Streeck, J. (1995) On projection, in E.N. Goody (ed.) Social Intelligence and Interaction: Expressions and Implications of the Social Bias in Human Intelligence. Cambridge: Cambridge University Press. Prefaces comprise a varied class of phenomena in the context of human interaction (gestures, micro-moments of silence, fully formed statements) that occur as prefatory components to bigger things to come (Streeck 1995). The function of a preface is to ‘foreshadow’ or ‘project’ something that comes after them, to bring into play and ‘prepare the scene’ (Sacks, Schegloff, & Jefferson 1974; Schegloff 1984). Prefaces enable others to anticipate intended actions and to respond accordingly, thus synchronizing the understanding of the participants (Goody 1995).